They govern an area that much of the media and popular culture often hold to be one of the most insecure and unstable on earth. Yet any basic and honest research will reveal the exact opposite. Among the world’s developing nations, all of which were formerly dominated by one or more foreign powers, it is arguably the case that no other six contiguous countries have been as societally secure or as stable overall as these over the course of the past four decades. Financially, they preside over the Arab region’s largest sovereign wealth funds and they collectively rank as among the world’s most generous peoples in terms of their philanthropic activities. Visitors to the region in recent decades will likely acknowledge that nowhere else among Arab countries will one find as robust, diversifying, modernizing, and developing a set of societies. The cultural and historical institutions in this corner of Arabia are, to wide acclaim, among the most modern, technologically innovative, and user-friendly as can be found in the so-called developing world. Though there has been much focus on the array of vast moneys devoted to strengthening their deterrence and defense capacities, far less attention has been paid to the Defense Cooperation Agreements between GCC countries’ governments and the government of the United States. These obligate the signatories to consult continuously, administer joint military exercises, conduct a broad range of defense-related assistance, provide education and training for professional development and mission effectiveness, provision for a variety of equipment positioning and facilities development considerations, and, generally, enhance the military infrastructure of all six GCC countries. Parallel to these developments, stretching back to before and throughout the 1980-88 Iran-Iraq war, the United States armed forces establishment has slowly but surely continued to relocate to the GCC region what has grown to become the greatest concentration of American armed forces personnel in any one area outside the United States. In so doing, they have spent more hours ashore in one of the GCC countries than anywhere else away from America. This has been done in association with elements of GCC countries’ armies to defeat the militant and violent extremist Islamic State of Iraq and the Levant group, also known as ISIS or Daesh. Hence, within this region stretching from the State of Kuwait to the Sultanate of Oman, the summit event which is about to unfold represents something quite unusual. Viewed up close, it is different from what many perceive and believe to be the case. Flags of the member states fly at the 1st GCC Summit in Abu Dhabi, UAE. Photo: Dr. John Duke Anthony, 1981. The 39th convening and hosting of GCC’s Ministerial and Heads of State Summit means something entirely unique for the inhabitants of this region. This year’s summit, brief as it is expected to be, is but one year shy of a four-decade experiment the likes of which the 22 Arab countries in the modern era previously had never known. 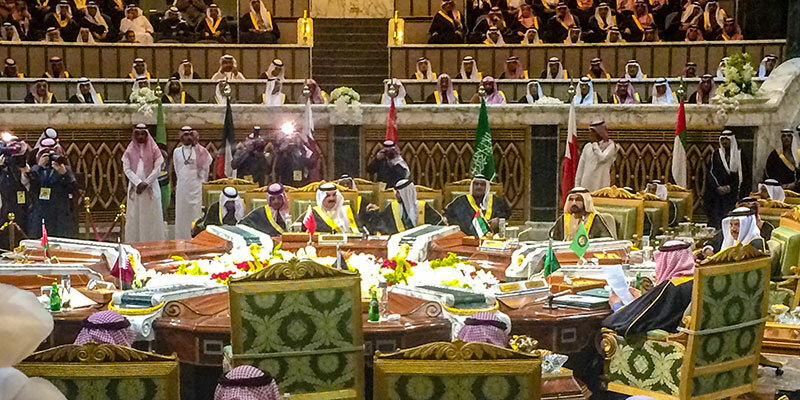 What is more, the GCC’s focus has hardly been narrow. Its emphasis has been and remains broad, deep, and diverse. Its work has ranged and continues to span the gamut from issues of governance and policies, the nature and extent of political dynamics, the members’ foreign relations, matters pertaining to deterrence and defense, cooperation against militant and violent extremists, and, among still other issues of joint concern, to the nature, pace, and extent as well as quality of economic, social, cultural, and human resource development. This year’s summit, brief as it is expected to be, is but one year shy of a four-decade experiment the likes of which the 22 Arab countries in the modern era previously had never known. 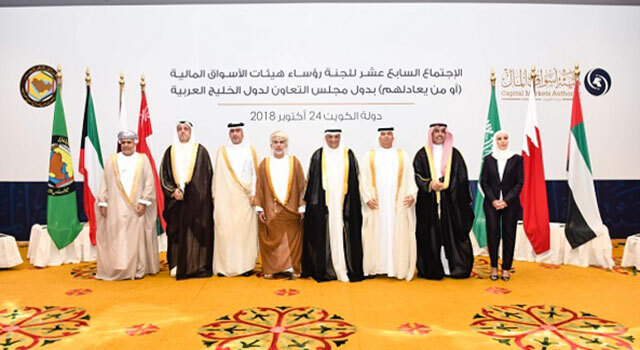 With this being the member-states’ 39th summit meeting, the GCC, despite its limitations – shortcomings and weaknesses that its leaders and private sector citizenry are the first to admit – and despite the fact that it has been under political stress and duress for the past year and a half, continues as before in its multifaceted functional dimensions. Overall, it remains on balance the most effective sub-regional organization in modern Arab history. More than that, the internal routine and regimens of its Secretariat-General, a realm of reality that seldom if ever makes it into the international news, are as robust as ever. In short, no other Arab experiment in interstate cooperation comes close to what the GCC has achieved, and it has done so in one of the most critical areas of the world. 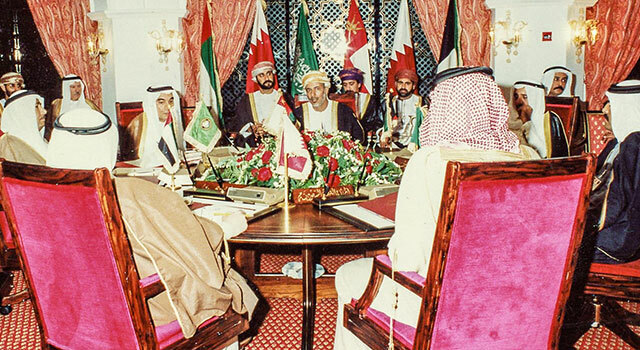 Domestically, the GCC has frequently been faulted for various shortcomings in terms of its achievements. Critics from within the region and further afield have leveled accusations at the organization. They have charged that it has fallen short of its original lofty promises. 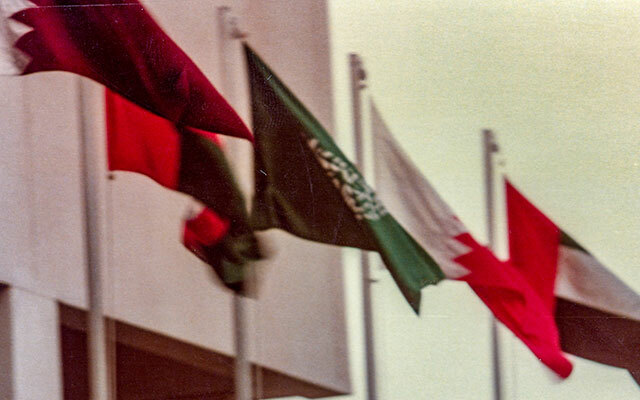 Harkening back to the organization’s May 1981 inception, they allege that the GCC has not lived up to many of the aspirations enunciated by the founders. The members themselves readily acknowledge that they have achieved nowhere near what they set out to accomplish more than thirty-seven years ago. [Left] H.E. 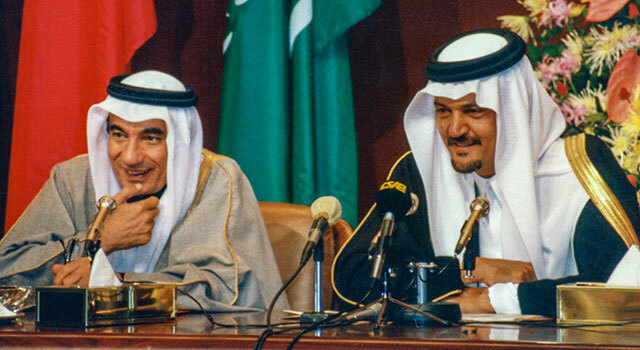 Abdulla Y. Bishara and [Right] HRH Prince Saud Al Faisal, Saudi Arabia’s long-serving Minister of Foreign Affairs (1975 to 2015), at the 8th GCC Summit in Riyadh, Saudi Arabia. Photo: Dr. John Duke Anthony, 1987. The establishment and administering from the GCC’s beginning in all six countries’ airports an ID card acknowledged GCC-wide for each and every citizen, coupled with distinctive travel privileges between member states. This allows GCC citizens to move from one place to another with special ease and, where possible, enables them to process through and largely ignore the time-consuming passport control procedures, customs processes, and other obligations required of non-GCC citizens. This freedom of movement for GCC citizens over time has been to the benefit of regional economies. The establishment of the requisite infrastructure and administrative system to ensure member-states’ adherence to international “best practices” protections for individual, corporate, and governmental property laws. The member-states established a GCC Patent Office some years ago. The Office, in prominent view and located but minutes from the organization’s Secretariat-General, is tasked with doing what it can to monitor, help administer, and where necessary assist in helping to facilitate GCC-wide compliance with such rights. It also seeks the members’ respective law enforcement agencies to indicate how best the member-states’ bureaucracies might best acknowledge and comply with intellectual copyright, patent, and trademark protections with special reference to prevailing precepts, rules, regulations, laws, and practices. An example of the GCC’s multifaceted functional dimensions: the GCC Heads of the Capital Market Authorities held their 17th meeting in Kuwait in October 2018. The meeting discussed integration of GCC capital markets, a memorandum of understanding between GCC market regulators, and the committee’s joint work with GCC central bank and other monetary institution leaders. Photo: Gulf Cooperation Council Secretariat General, 2018. The linkage of GCC countries’ electrical grids, a critical component of members’ infrastructures that is essential to ensuring individual comfort and vital to member-states’ overall national material wellbeing. Pan-GCC agreement regarding a common tariff of 5 percent for most imported goods while, in keeping with internationally-recognized schools of thought, allowing for continuing protections for certain enterprises. The GCC’s economic integration efforts have been a significant factor driving growth in intra-GCC trade. Accommodation not only to the enactment and administration by Bahrain and Oman of Free Trade Agreements with the United States that are designed to help accelerate and promote provide greater commercial benefits to the citizens and governments of these two GCC countries. Additionally, underscoring the ongoing practice of an age-old tradition of generosity together with an abiding sense of shared culture, faith, and family among the member-countries, the four better economically endowed GCC members – Kuwait, Qatar, Saudi Arabia, and the UAE – pledged to contribute to Bahrain and Oman 10 billion dollars each over the course a ten-year period that is still underway. Commitment to, even if as of yet the member-states are not near fully implementing: (1) a common currency; (2) a customs union; and (3) a pan-GCC railroad, which, when and if it is built and operational, would stand to revolutionize the GCC’s existing sub-regional economic, commercial, financial, port management, warehousing, customs administrations, and other infrastructures that are linked to the citizenries’ standard of living. There is little doubt that the railroad, once operational, would benefit the entire GCC region. It would, however, almost certainly benefit some countries more than others. For example, Oman, which lies closest to the world’s main maritime trade routes, on one hand, and, on the other, possibly Saudi Arabia and/or Kuwait, both of which have closer overland road links to Europe and other markets, with Saudi Arabia, of the two, possessing the greater geographic advantage as it is the sole GCC country to lie adjacent to the Red Sea and near the Suez Canal. Overall, the GCC remains on balance the most effective sub-regional organization in modern Arab history. Given that the railroad would benefit some of the member-states more than others, it remains to be seen how and whether the requisite negotiations and spirit of compromise will occur. This said, the European Union, Association of Southeast Asian Nations, European Free Trade Association, North American Free Trade Agreement/United States–Mexico–Canada Agreement, and other intra-regional economic arrangements provide a wealth of knowledge and insight as to what is and might be possible. The key is strong, visionary, and persuasive leaders who can effectively demonstrate an ability to put the benefit of all six members, and not just advantages to one or a few, above all else. A tough challenge, yes, but look at the successes of those that have met and surmounted it. Externally, the story has been different. The GCC has had war and/or a foreign-influenced uprising on its doorstep five times since its inception. The first was the eight-year Iran-Iraq war from 1980 to 1988. The second entailed the reversal of Iraqi aggression against Kuwait in 1990-1991. The third armed conflict refers to the 2003 U.S.-led invasion and occupation of Iraq, the devastating far-flung regional and international consequences of which remain ongoing to this day. The fourth instance occurred when three of the organization’s member-states came to quell a foreign-aided domestic insurgency in Bahrain in 2011. A fifth occasion that represented a threat to regional insecurity and instability has been the ongoing civil war in Yemen, which neighbors two of the GCC states. Regarding that conflict, the GCC countries and its current Secretary-General were central to the enactment in 2015 of UN Security Council Resolution 2216 that has remained the central international legal instrument governing the conditions by which the international community continues to call for a ceasefire and resolution of the issues outstanding among the warring parties. 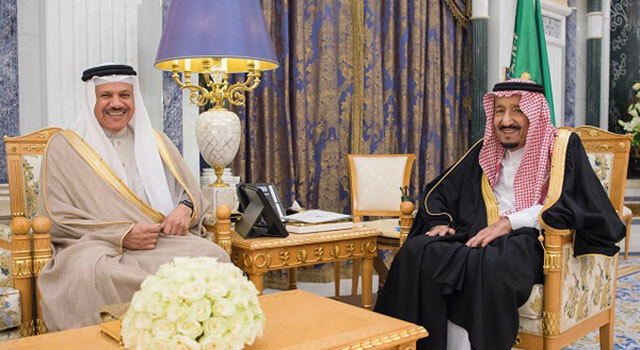 [Right] The Custodian of the Two Holy Mosques, King Salman bin Abdulaziz Al Saud with [Left] H.E. the Secretary-General of the Gulf Cooperation Council Dr. Abdullatif bin Rashid al-Zayani at a November 2018 meeting in Riyadh. Photo: Gulf Cooperation Council Secretariat General, 2018. The GCC and the organization’s member-countries’ contributions to ending two of these wars and containing a third have been nothing short of monumental. In association with their principal allied partners, they helped lead the internationally concerted actions that ended the Iran-Iraq conflict, they were vital to reversing Iraq’s aggression against Kuwait, and they have cooperated extensively with their Great Power partners to prevent the chaos and strife caused by the American-concerted illegal attack against Iraq from spreading to the GCC countries. These are but a few of the GCC’s achievements that seem to be so little known and appreciated by students of international affairs. An examination of what the GCC is and is not, and where it’s member-states have registered success in the quest for greater regional coordination, consultation, and consensus, provides useful lenses through which to view the organization. The GCC and its members have endured innumerable challenges, which they have often surmounted and ended, with more to come.